Giles Rendell was born in West Coker in 1879, one of the eight children of agricultural labourer, later mason, Giles Rendell (1842-1884) and Zabiah née Hill (1843-1925). In the 1891 census Zabiah, now a pauper, was living in Manor Street, West Coker, with her 23-year old daughter Julia, a domestic servant, sons Herbert and Giles, aged 15 and 12 respectively and both working as agricultural labourers, while 8-year old Thomas was at school. By 1901, still at Manor Street, Zabiah was working as a charwoman while Giles and Thomas were both working as twine makers at Gould's twine factory. In the winter of 1902, at the age of 23, Giles married Jessie Florence Smith (b1881), originally from Woodstock, Oxfordshire. They moved to Yeovil after their marriage and the 1911 census recorded them at 45 Higher Kingston together with their 6-year old son Denzil (they were later to have another child). Giles gave his occupation as a brewery maltster and is known to have worked at Brutton's Brewery in Clarence Street. Giles enlisted at Yeovil in June 1916, joining the Somerset Light Infantry. His Service Number was 26234 - his brother Arthur (known as Thomas) had enlisted on 15 June 1916 and joined the 7th (Service) Battalion, Somerset Light Infantry (Arthur's Service Number was 26019). Giles, however, was soon to transfer to the Machine Gun Section, 15th (Service) Battalion of the Hampshire Regiment. His new Service Number was 27126. This battalion had been in France since early May 1916 and Giles joined them there in October 1916 after the battalion had been in action in the Battle of Flers-Courcelette, a part of the Somme Campaign. Giles was almost immediately in action at the Battle of the Transloy Ridges (in which his brother Thomas also fought, with the 7th Battalion, Somerset Light Infantry. The Battle of the Transloy Ridges began in good weather and Le Sars was captured on 7 October. Pauses were made from 8–11 October due to rain and 13–18 October to allow time for a methodical bombardment, when it became clear that the German defence had recovered from earlier defeats. Haig consulted with the army commanders and on 17 October reduced the scope of operations by cancelling the Third Army plans and reducing the Reserve Army and Fourth Army attacks to limited operations in co-operation with the French Sixth Army. Another pause followed before operations resumed on 23 October on the northern flank of the Fourth Army, with a delay during more bad weather on the right flank of the Fourth Army and on the French Sixth Army front, until 5 November. Next day the Fourth Army ceased offensive operations except for small attacks intended to improve positions and divert German attention from attacks being made by the Reserve / Fifth Army. After the battle Giles, with the 15th Battalion, resumed daily life in the mud of the Somme trenches until his battalion took part in their next set-piece battle, the Battle of Messines. Sadly, during the initial advance on 7 June 1917 Giles was hit in the side by shrapnel and died in the arms of his comrade in a shell hole on the battlefield. He was 38 years old. 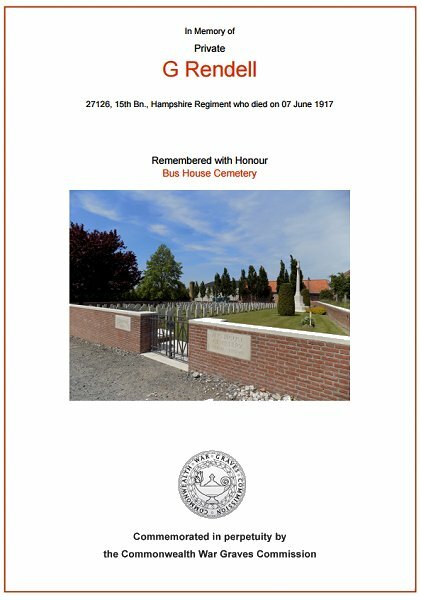 Giles was interred at Bus House Cemetery, West Vlaanderen, Belgium, Grave A22, and his name is inscribed on the War Memorial in the Borough. Giles' brother Thomas died of pneumonia in France on 2 February 1917 - click here. The entries in the West Coker parish register for the baptisms of brothers Arthur and Giles Rendell on 24 September 1882. The Commonwealth War Graves Commission certificate in memory of Giles Rendell. 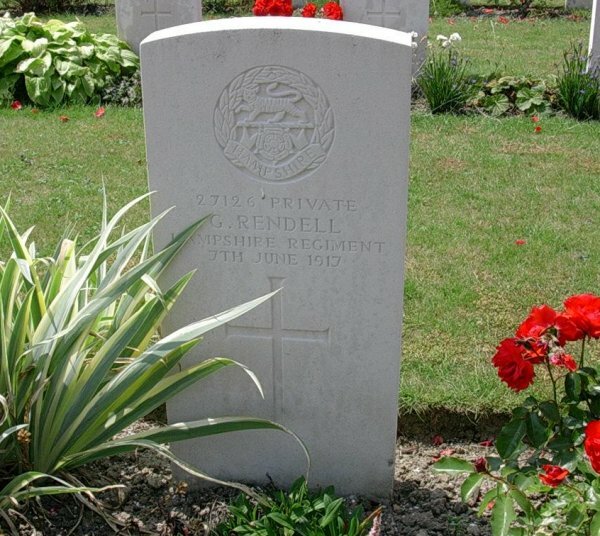 Giles Rendell's CWGC headstone in Bus House Cemetery.